The foundation of your home should be the most stable part of your home. It is what your home relies on to maintain it’s shape and safety. But, Dallas-area homeowners have a problem to contend with: our soil. Rock Solid Foundation Repair is your premier foundation repair company that’s focused on the Dallas area. We live, love, and work here so knowing the unique problems Dallas has with home foundations is our specialty. Depending on the type of problem your foundation is experiencing you can sometimes make the call to DIY your repair to save some money and your foundation at the same time. We’ve put together a handy guide to help you decide if your foundational problems are worth a good old-fashioned DIY. And remember, if you have any questions along the way, leave the guesswork out of your foundation repairs and contact us. We’ll be more than happy to come and evaluate your foundational problems to see what repairs suit your needs best. As we all know, Dallas is a unique place. But some aspects of the are are better than others; our soil in Dallas is what’s known as expansive soil and it can cause quite a few big problems when it comes to home foundations. This type of soil contains clay, and it is prone to taking in moisture during rains and expanding. When the moisture dissipates, the soil will contract and shrink back down. Though this is a natural process, it does not mix well with home foundations. When your home is built on a foundation, builders anticipate that foundation to offer your home a stable ground to sit atop. As expansive soil expands and contracts, the foundation on top of it is shifted accordingly. Over time, the shifting that happens from the expansive soil in Dallas can cause cracks in your foundational slab or supports, cracks in your ceiling or wall, gaps in window sills, and doors that no longer open or close smoothly due to the shifts the house has undergone. These are all indicators of foundational problems that should not be ignored. Pardon our pun, but foundations are quite foundational to the safety and structure of your home. Trying quick fixes to temporarily stave off a problem may not be the most money efficient option in the long run, especially if the problem is suddenly exasperated by a sudden rain that required your house to have a solid foundation rather than a patched one. Knowing when to call a professional is key in these cases so that you can complete preventative and emergency work before the situation gets out of hand. If you are skilled in home repairs and feel confident about tackling your foundational cracks, be sure to gather your resources and information before you have at it. However, if you are a newbie to DIY fixes or haven’t worked with foundations before, it may be best to call an expert to help you. As always, Rock Solid Foundation Repair is here to help with whatever foundation services you need– we’ve even put together tons of blog posts to help you become informed homeowners! If you feel confident that you’ve pinpointed the causes of your foundational cracks, and know that you are skilled enough to take on the repairs yourself, it’s time to start working on sealing your foundation! It is important to decide early on if you will use a repair kit or if you will pick up the sealant products yourself. There are a few key differences between the use of a kit and of other products, like epoxy injections. Repair kits are typically used for small problems or as temporary fixes until a repair company arrives. Though sometimes the fix provided by these kits is enough to last a while, this is often not the case since cracks indicate a larger problem with the structure of your house. On the other hand, solutions like using epoxy injections can create a more professional “fix” by sealing water and moisture out from the crack that you are filling. Epoxy fillings are recommended for DIYers because it creates a bond between the cracked walls to better prevent problems and leaks in the future. 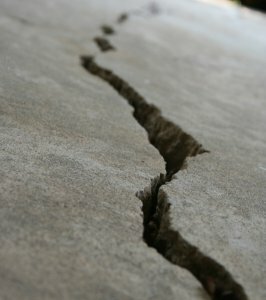 Many cracks are associated with dirt and debris surrounding the area or floors closest to the crack. You will want to begin by cleaning the area so that you have a clear surface to work with while you are completing your repairs. If water leakage has occurred, be sure to dry the area and ventilate the room to prevent mold growth from spreading. According to FEMA, mold can begin to grow just 24 to 48 hours after the leak initially happened. Be sure to check carefully to save yourself the money and health problems associated with mold. Once you have cleaned the area and removed mold and dirty water from the area, be sure to re-wet the crack with clean water to allow your filling to better stick to the walls. You will want to mist the area with water, rather than completely douse it, so that the patching material you are using has moisture to use during the bonding process rather than pulling moisture from the surrounding wall, further weakening the bond. Whether you elected to use a repair kit or an epoxy injection, you will take to take your time filling the crack and removing the excess sealant from the walls with a towel or scraping device. After this, you will want to clean your tools and the surrounding areas to ensure that the sealant isn’t adhering in a place it shouldn’t be. And with that final step, you’ve completed your first foundational repair! Rock Solid Foundation Repair is a Dallas company that is here to make sure that your home is structurally safe and free from foundational issues. If you have any questions- contact us!